My new project is a pair of socks for me. The yarn, Fiesta Boomerang in the Abalone colorway has been in my stash for years, as has the sock pattern. Serpentine is from the book Socks From the Toe Up by Wendy Johnson. I love the book and I love the sock patterns in it. I prefer toe-up socks because their construction seems more natural to me and fits my knitting style. The socks I finished for The Skipper were the last cuff down socks I intend to make. I find cuff down construction fiddly. I don’t like picking up for the gusset stitches, then decreasing back down. I absolutely despise the toe decreases and the struggle to turn the sock right side out to Kitchener Stitch the toe closed. Toe up construction is just pure knit. When I’ve reached the length I want on the leg I just cast off. I prefer short-row toes, which I did here. 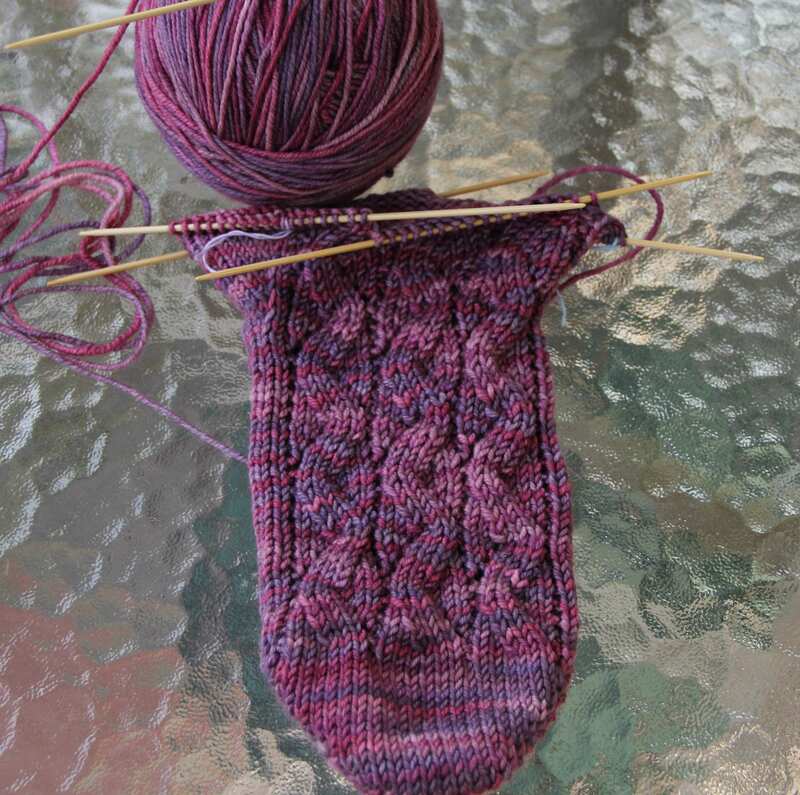 I’ve just finished increasing for the gusset and am ready to turn the heel, then knit the leg. In the meanwhile I am waiting for the yarn to arrive from England for my next little girl sweater. I am sure it’s stuck somewhere in the morass called US Customs. If it’s not here by Wednesday, I will have to see about tracking it down and breaking it loose. Sunday I spent with my sewing machine mending the hole Yarn Rascal chewed in my nice sheets. I am happy with the mend even though it took me longer than I thought it would. But that’s what happens when I pin the mending patch in place not only on the sheet but to my jeans too. I had to unpin, reposition the scrap of fabric, and pin again without catching my jeans. Yarn Rascal was in attendance the whole time. I discovered he likes fabric scraps, spools of thread, and bobbins just drive him over the edge. I think he has crafting in his gene pool. But I just can’t figure out how it got there.